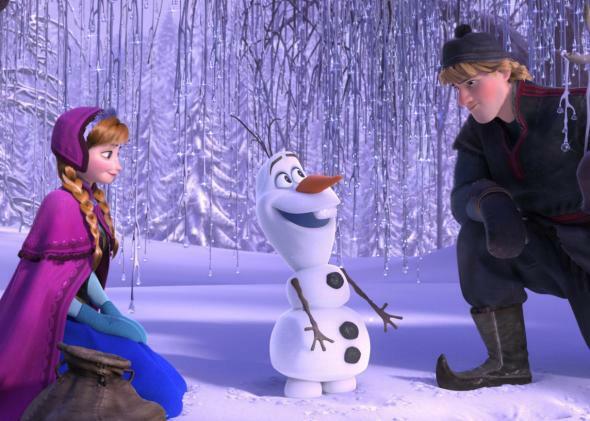 Disney Q1 2015 earnings: The Frozen sales magic shows no signs of freezing over. Princesses Elsa and Anna and their friendly snowman sidekick Olaf hit theaters more than a year ago, but for Disney, the Frozen sales magic is still going strong. On Tuesday, Walt Disney shattered Wall Street’s expectations for its first quarter, led by seemingly inexhaustible demand for all things Frozen. Revenue at Disney’s consumer products division surged 22 percent to $1.38 billion and operating income in that segment jumped 46 percent to $626 million—the “most successful quarter ever for Disney consumer products,” Disney Chief Executive Bob Iger said. Disney’s stock was up about 8 percent to $101.59 as of midday Wednesday. The tremendous success of Frozen merchandise should come as no surprise to anyone who has tried to buy Frozen-themed stuff. After the Frozen craze caught retailers off guard in early 2014, stores were well-stocked for the holidays. Elsa products were in particularly great supply—Walmart said in November that it expected the “Snow Glow Elsa Doll” to be one of its best-sellers. There were also Frozen lunch boxes, Frozen light-up microphones, Frozen tea sets, and, my personal favorite, Frozen Olaf “cuddle pillows.” Toys R Us reportedly stocked about 300 different Frozen products while Walmart offered 700. Even so, many retailers sold out. Of course, Disney didn’t get too specific with its numbers on Frozen merchandise sales, so we may never know just how many of those Olaf cuddle pillows were actually sold. Perhaps understandably, the company also seems wary of attributing too much of its current success to just the one film. “I don’t think we can underestimate the impact that Frozen has had across our company in all of our businesses,” Jay Rasulo, Disney’s chief financial officer, said. “But I don’t think it would be right to take from that the implication that even our consumer products business was overly dominated by the Frozen franchise this quarter.” Iger noted that Frozen is one of 11 Disney franchises driving more than $1 billion in annual retail sales each. On the other hand, Disney knows it has a hit in Frozen and plans to keep milking it for all its worth. As Iger reminded everyone on the call, Frozen Fever, a new seven-minute short with “all the beloved characters and voices” and a “great new song,” is set to premier on March 13.